Smart Home, smart portable micro gardens, smarter kids, smart city. Chicago's "Greenest Home" will reopen on Earth Day—April 22, 2011—with new gadgets and inventive ways to live green! See the home that has shown more than 200,000 guests some ways, big and small, to make eco-friendly living a part of their lives. The Smart Home, a fully-functioning, eco-friendly home on the Museum’s grounds, is a must-see exhibit for anyone who wants their home, and life, to be smarter, more efficient and more in tune with the environment than it is today. 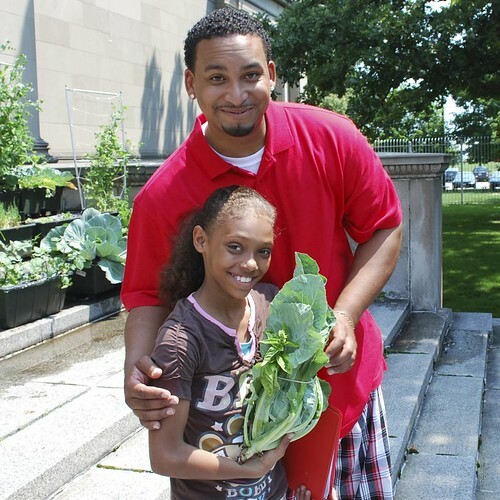 These Chicago school kids and a mom are going to enjoy a bounty of fresh greens from a city farm of an unusual kind. Have a look at the photos below and see where it came from. EarthBoxes are growing fresh food on the cold granite steps of the Chicago Museum of Science and Industry entrance. Does this look like a farm? Well it is. If our education system was working we would have many more sub-irrigated planter (SIP) farms and gardens like this in cities across the country. In my view, the fact that we don't have them is a national disgrace. Part of the reason is here. According to a Ron Wolford Tweet, Brian Corsetti, aka Garage Mahal of the DIY Network is going to remodel the Smart Home garage into a Master Gardener work space. Very cool! They deserve it. When I get new knees, I'll be there! From a drive-in movie theater complete with flat-screen TVs to a Vegas-style casino that descends from the ceiling, DIY Network's Garage Mahal takes tricking out your garage to a new level. With a little ingenuity, expert host Brian Corsetti transforms everyday garages into unusual, jaw-dropping spaces. Help Put a Dent in Diabetes: Start Here! 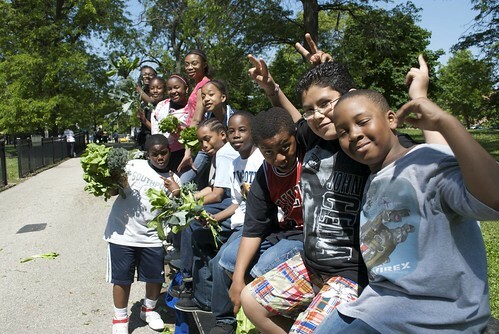 Thanks to Extension Program Educator Ron Wolford and a group of Chicago Master Gardeners, these kids from the Bret Harte school have just experienced the joy of harvesting their own fresh vegetables. The vegetables were grown in EarthBox sub-irrigated planters (SIPs) on the steps of the Museum of Science and Industry, site of the Smart Home. Why aren't we doing this all over the country to help fight our national problem of obesity and diabetes? The problem isn't money. It is an educational problem pure and simple. Modern Age Urban Gardening: These Kids, Parents And Teachers Get It! Thanks to Extension Program Educator Ron Wolford and a group of Chicago Master Gardeners, kids from the Bret Harte School learned that there is more to urban food production than pulling a hoe or stepping on a spade. The EarthBoxes in winter storage at the Museum of Science and Industry Smart Home in Chicago may be asleep but these brains are wide awake and alert planning the 2010 garden. Go Smart Home green team!